Straight Shooter, issued the following year, was another major success, notching the hit “Feel Like Makin’ Love,” while 1976′s Run With the Pack was Bad Company’s third consecutive million-selling record. After 1977′s Burnin’ Sky, Bad Company recorded 1979′s Desolation Angels, which embellished the group’s sound with synthesizers and strings; a three-year hiatus followed before the release of Rough Diamonds, the group’s final LP in its original incarnation. In 1986, Ralphs and Kirke resurrected the Bad Company name, enlisting former Ted Nugent vocalist Brian Howe to replace Rodgers. The reconfigured unit’s debut, Fame & Fortune, was a commercial failure, but 1988′s Dangerous Age became a minor hit. Released in 1990, Holy Water fared even better, as the power ballad “If You Needed Somebody” became a Top 20 success. 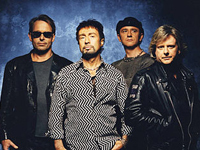 Here Comes Trouble, issued in 1992, achieved platinum status, and earned another Top 40 hit with “How About That.” On their 20th anniversary, Bad Company expanded into a quintet with the addition of bassist Rick Wills and rhythm guitarist Dave Colwell, and released the live retrospective The Best of Bad Company Live…What You Hear Is What You Get.